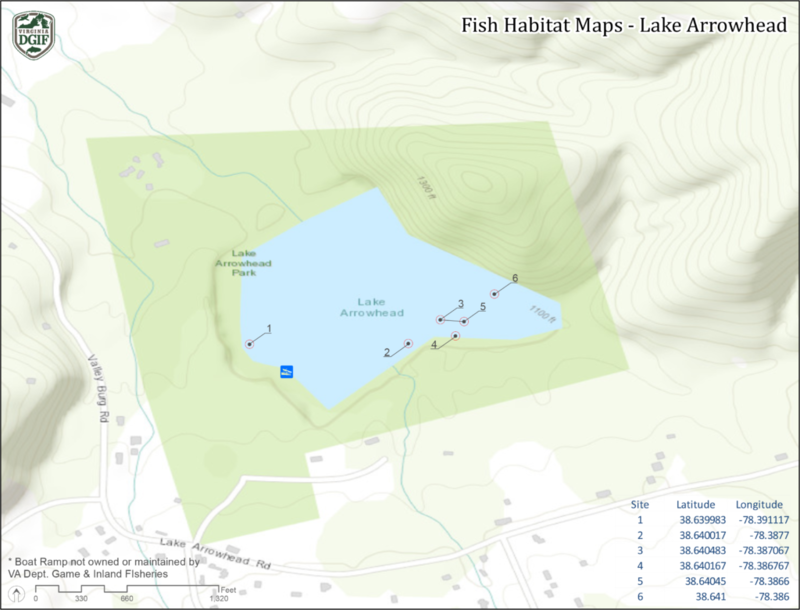 Lake Arrowhead is a 39 acre impoundment located in Page County near Luray, Virginia. The lake was constructed in 1971 by the USDA Soil Conservation Service as a flood control impoundment. The lake is owned by the Town of Luray and the Virginia Department of Game and Inland fisheries manages the fishery. Lake Arrowhead sits at the foot of the Blue Ridge Mountains offering a magnificent view of the Page Valley. Gradual sloping banks, relatively clear water, and a maximum depth of 43 feet best describes the physical make up of the lake. The lake basin was cleared of all structure during construction making underwater structure sparse. A local angling club, Page Valley Bass Anglers, has been active in adding brush fish attractors to the lake. In recent years overabundant aquatic vegetation (elodea) had become a problem in the shallow areas of the lake. The Town of Luray has gone to great effort by using herbicides and triploid grass carp to control the vegetation. Anglers have the opportunity to fish for largemouth bass, walleye, northern pike, bluegill, crappie, redear sunfish, and channel catfish at Lake Arrowhead. The largemouth bass population has remained consistent for the past several years. Historically Lake Arrowhead had a high density of small bass. Bass densities have been streamlined and the number of fish greater than 12 inches has improved significantly. The current 11-16 inch slot regulation for bass appears to be acting as a 16-inch minimum size limit. Biologists collected only a few bass greater than 16 inches in recent samples. Largemouth bass are slow growing in Lake Arrowhead with fish not reaching 11–12 inches until age 4. With these slow growth rates, anglers need to harvest some bass less than 11 inches in order for the slot limit to be successful in producing bass greater than 16 inches. Anglers should concentrate on downed trees, beaver lodges, and weedbed edges when targeting bass. Lake Arrowhead can become quite clear so anglers should use baits/tactics to match the conditions. The sunfish population is well proportioned. The bluegill to redear sunfish ratio is about 2:11. Historically the sunfish in Lake Arrowhead were overpopulated and “stunted”. In recent years sunfish numbers have been reduced by aggressive predator stocking by the Department of Game and Inland Fisheries. Stocking walleye, channel catfish, and northern pike have helped produce a better quality sunfish population. Anglers should find anywhere in the lake to be a good place to catch sunfish. Lake Arrowhead exhibits a modest crappie fishery. The crappie population consists mostly of fish 7-9 inches. Anglers should look for woody structure like braver lodges and downed trees when targeting crappie. There is a limited fishery for northern pike in Lake Arrowhead. Northern Pike do not naturally reproduce in the lake and are stocked by DGIF annually. Pike are stocked to help keep sunfish from overpopulating and to provide angling diversity. Lake Arrowhead has produced some very large catfish in recent years. A few fish weighing over 20 pounds have been caught in the last few years. Channel catfish spawning is limited in the lake so VDGIF stocks this species annually to maintain the population. All bass 11-16 inches must be released. 50 per day in aggregate. All northern pike less than 20 inches must be released. In addition to a valid Virginia Freshwater Fishing License, a fishing permit issued by the Town of Luray is also required. Permits can be obtained at the town office (540-743-5511). The use of gasoline boat motors is prohibited. Electric trolling motors are welcome. Lake Arrowhead is the focal point of the 134 acre Lake Arrowhead Park Recreation Area. The park is owned and operated by the Town of Luray. Boat access includes a concrete boat ramp with courtesy dock. Shoreline fishing access is excellent around roughly 70% of the lake. The lake also includes a large swimming area with a beautiful white sand beach. A fee is required to use the swimming area. A food concession stand operates next to the beach during the Summer months. For the hiker, there are over two miles of marked trails throughout the park. Other facilities offered at the park include: Five picnic shelters, playground areas, cook out grills, horseshoe pits, a softball field, and handicapped accessible restrooms.